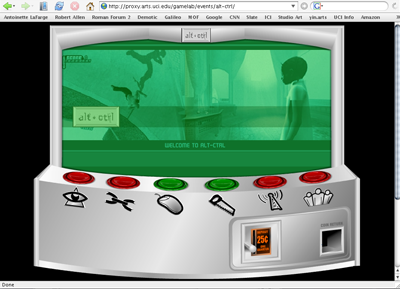 In 2004, I co-curated (with Robert Nideffer and Celia Pearce) "ALT+CTRL: a festival of Independent and Alternative Games" at the Beall Center for Art + Technology at UC Irvine. ALT+CTRL was a sequel to the Beall's forward-looking 2000 exhibition "SHIFT-CTRL: Computers, Games and Art," which I also co-curated. ALT+CTRL was a new festival celebrating the most passionate and experimentally minded game artists in the world and showcasing innovative concepts in game genres, designs, methodologies, and game play. 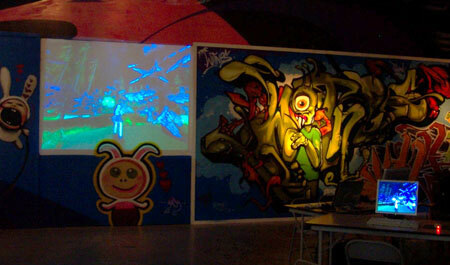 Over 20 works were shown, including modded games, hot-rodded game machines, net-based games, and installlations. The show included special screenings of machinima films made "on location" in various games. In tandem with the show was a panel on game culture with contributors to the 2004 anthology First Person: New Media as Story, Performance and Game, moderated by editor Noah Wardrip-Fruin. The roster of artists included Auriea Harvey and Michaël Samyn, Brody Condon, c-level, collapsicon, delire and pix, Eddo Stern, gameLab, Geoffrey Thomas, Indie Game Jam, Maia Engeli and Nina Czegledy, Molleindustria, Nick Montfort, Noah Wardrip-Fruin, Josh Carroll, Robert Coover, Shawn Greenless, and Andrew McClain, Olaf Val Mignon, Pappy Boyington, Rebecca Cannon, RSG, THE JAB, and yumi-Co.
ALT+CTRL was juried by the curators together with an outside panel of jurors from the independent game scene, including Rebecca Cannon, Drew Davidson, Erkki Huhtamo, Paul Marino (who led the jurying for the machinima works), Jeannie Novak, and Eric Zimmerman. 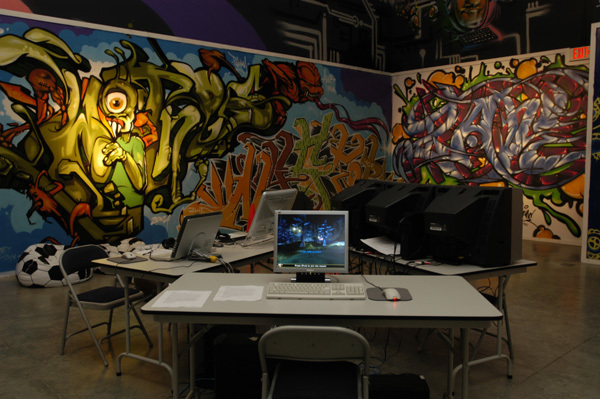 The show environment was designed by the curators and centered on an informal arrangement of computer stations scattered throughout the space, much as such terminals are set up ad hoc for game jams. 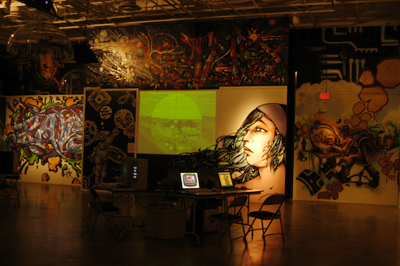 The space was enlivened by wall murals that were visual interpretations of computer games, avatars, and modding created for the show by a group of Southern California graffiti artists led by Chris Coggan. A website was created to serve as an online exhibition archive and catalog. I designed the logo for "ALT+CTRL" as a visual riff on the computer keys that inspired the show title.